Senate Bill 1262 is dead for the year after failing to pass the Assembly Appropriations Committee today, and a new author will be needed to push a similar bill next year. At one point, SB 1262 had bipartisan support from Assembly Member Tom Ammiano, a staunch advocate for medical cannabis patients, and the bill’s chief author, state Sen. Lou Correa. The bill would have created a state Bureau of Medical Marijuana Regulation in the Department of Consumer Affairs with authority to issue state licenses for cannabis growers, processors and dispensaries. But it also would have allowed cities and counties to keep banning dispensaries, as they have in Fresno, Fresno County and most of the Central Valley. 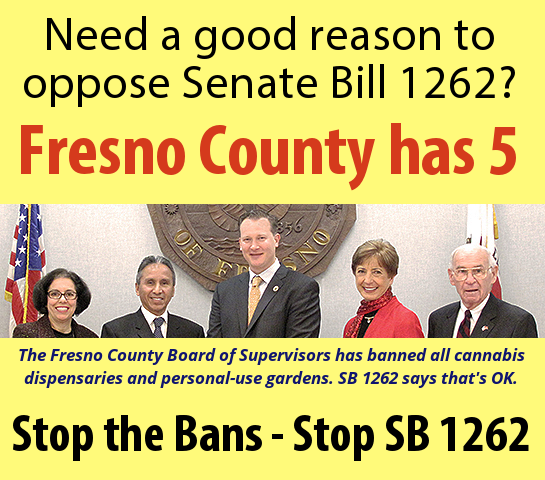 The Fresno Cannabis Association opposed SB 1262 with letters of opposition sent to key lawmakers and staff, but the bill had substantial support from other cannabis organizations including Americans for Safe Access. With Ammiano and Correa both leaving office due to term limits, the search is on for new authors willing to tackle cannabis reform in 2015. SB 1262 represented a departure from years past because it was sponsored by the California Police Chiefs Association and the League of California Cities, which had steadfastly opposed all of Ammiano’s previous bills. The cop lobby got a taste of its own medicine as key opposition emerged from the California State Association of Counties, the city of Los Angeles, and cannabis advocacy groups including FCA and California NORML. Although ASA and FCA didn’t see eye-to-eye on SB 1262, we’re very supportive of ASA’s legislator email campaign to support Senate Bill 1193. Just follow the link and plug in your ZIP Code to start a letter of support to your Assembly member. The bill just passed the Assembly Appropriations Committee, and a floor vote could come soon. SB 1193 is common-sense bill that will help guide police who seize cannabis from qualified patients and collectives. If no charges are filed, they’re supposed to return your cannabis, as a California appellate court ruled in 2007 in a case from Garden Grove. Apparently the cops and sheriffs didn’t get the memo, because many agencies still routinely seize and destroy cannabis without compensation. SB 1193 would clarify that the Garden Grove decision represents good law and good public policy that must be respected by law enforcement. Where that doesn’t happen, it allows qualified patients to bring legal action seeking monetary damages for the value of their destroyed medicine. Quick hint: Form letters are great, but personalized letters are even better. When you write your letter of support for Senate Bill 1193, change the subject line so it stands out from the crowd, and customize the letter text to your liking. Chances are your letter won’t get a close reading, but the quantity and quality of letters is still very important.